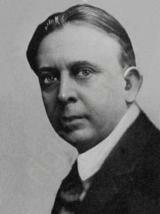 Octavian Goga (April 1, 1881-May 7, 1938) was a Romanian politician, poet, playwright, journalist, and translator. Born in Rasinari, nearby Sibiu, he was an active member in the Romanian nationalistic movement in Transylvania and of its leading group, the Romanian National Party (PNR) in Austria-Hungary. Before World War I, Goga was arrested by the Hungarian authorities. At different intervals, until the union of Romania and Transylvania in 1918, Goga took refuge in Romania, becoming active in literary and political circles. Because of his political activity in Romania, the Hungarian state sentenced him to death in absentia. During World War I, he joined the Romanian army and took part as a soldier, in the occupation of Dobrogea. Goga clashed with Averescu over the latter's conflict with King Carol II. A founder of the minor PP splinter-group naming itself the National Agrarian Party, he led it into an alliance with A. C. Cuza's National-Christian Defense League, forming the National Christian Party. He became Prime Minister of Romania and served December 28, 1937 to February 10, 1938. He had been appointed by King Carol, in his attempt to enforce his own personal dictatorship. During his short period in government, Goga was mostly known for the first anti-Semitic laws which were passed. On January 12, 1938 his government stripped Romanian Jews of their citizenship. Besides being an anti-Semite himself, Goga attempted to outflank the Iron Guard's popular support. The regime instituted by Goga and Cuza gave itself a paramilitary wing of Fascist character, the Lancieri ("Lance-bearers"). They borrowed heavily from the Iron Guard, and started competing with it for public attention. Mainly, they were involved in violence against the Jews. After his resignation, Goga withdrew to his estate in Transylvania, where he suffered a stroke on May 5, 1938. He died two days later. His body lay in state in Bucharest's Palace Atheneum, with a floral tribute from Nazi Germany leader Adolf Hitler adorning the glass-topped casket. In addition, Goga is known as the translator of works by Sándor Petőfi, Endre Ady, and Imre Madách.